What factors matter most? Where do I focus effort? How do I use “ripple effects” and “IFTTT” (If This, Then That) thinking? How do I avoid getting frustrated? This last point is what I want to address in this column: yes, 42 factors may affect blood glucose, but we can still do something about it. Here are five tips that have really helped me conquer the unpredictability, many of which are summarized in Bright Spots & Landmines – get the free PDF or find it for $2-$6 at Amazon. Carbohydrates (#1, #2) are the biggest driver of my blood sugar spikes, as well as the spikes of so many others. Consequently, reducing carbs takes out one of the largest variables in diabetes, keeps me much safer when dosing medication, cuts my stress and worry, and lets me put diabetes in the background. As I’ve written before, I personally aim for less than 30 grams of carbs at one time, with most of those carbs from high-fiber, low-glycemic sources: nuts, seeds, vegetables, and berries. Chapter one of Bright Spots & Landmines has my complete eating toolkit. If this seems like a huge step, doing low-carb at breakfast is a terrific starting point. 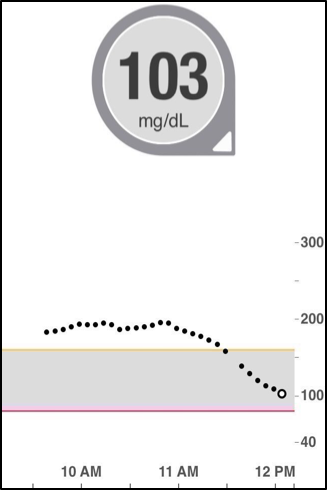 Glucose monitoring (#39) is the best way to learn what works and to guide safer diabetes driving, especially with paired checks. For example, check glucose right before eating and then 2-3 hours later – what do you learn? Obtaining more frequent glucose data is like a supercharger for conquering the other 41 factors, as it helps find patterns, identify what’s working (Bright Spots) and what isn’t (Landmines), and guide real-time decisions. If you need access to more strips, visit diaTribe.org/GetMoreStrips. If you wear CGM, get my tips at diaTribe.org/CGMTips. Glucose monitoring questions to ask yourself: “When is my blood sugar in range – 70-180 mg/dl or 70-140 mg/dl, depending on your target – what behaviors and choices might be driving that, and how can I increase those Diabetes Bright Spots? When is my blood sugar consistently going high (over 180 mg/dl) or low (less than 70 mg/dl)? What might be driving those patterns, especially related to food choices and medication dose/timing? What experiments can I try, aiming to stumble on those landmines less often? For more complete questions to ask yourself, see the end of each chapter in Bright Spots & Landmines. Medication dose and timing (#10, #11) are variables within my control and make a big difference on daily blood sugars. There are still many people with diabetes who are (i) not on the optimal dose of medication (especially insulin); or (ii) might benefit from a different dosing schedule, depending on what the medicine is. (Insulin that is taken several times daily has more dosing flexibility than a once-weekly injectable for type 2.) Timing is an under-recognized piece of the puzzle, in my view – WHEN I take my medicine can matter just as much as WHAT and HOW MUCH is taken. For instance, taking mealtime insulin 20 minutes or more before eating can make a big difference on post-meal blood sugars, especially at breakfast or when eating more than 30 grams of carbs at once. The same can be true for injecting some of the older basal insulins, especially Lantus/Levemir – some people find that “splitting the daily dose” into morning/evening prevents unexpected highs and lows (see this article as one example). The best way to optimize your medication dose is to get more frequent glucose data – real-time or professional (“intermittent”) CGM – and talk to your healthcare provider. Not all factors exist in isolation – some influence blood sugars directly AND indirectly, which can spill over into other factors. 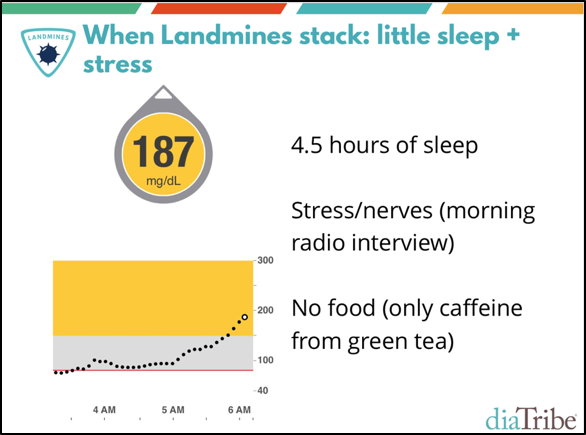 A great example of this is insufficient sleep (#20), which is a force multiplier for so many things in diabetes. When I get less than seven hours of sleep, I see higher next-day blood sugars, more insulin resistance, more hunger, more carb cravings, more stress, and less desire to exercise. Wow! Addressing this single factor has a big “ripple effect” on many other factors, which makes it worth prioritizing, even if I’m tempted not to. Recent hypoglycemia (#22) is another factor with a “ripple effect,” since it can easily cause repeat hypoglycemia, which can easily lead to a hypoglycemia binge, a rebound high blood sugar, and then a “rage bolus” followed by another low. Correcting hypoglycemia with an automatic, go-to, quantity-limited food has been a personal Bright Spot for me; read here for more. 3. 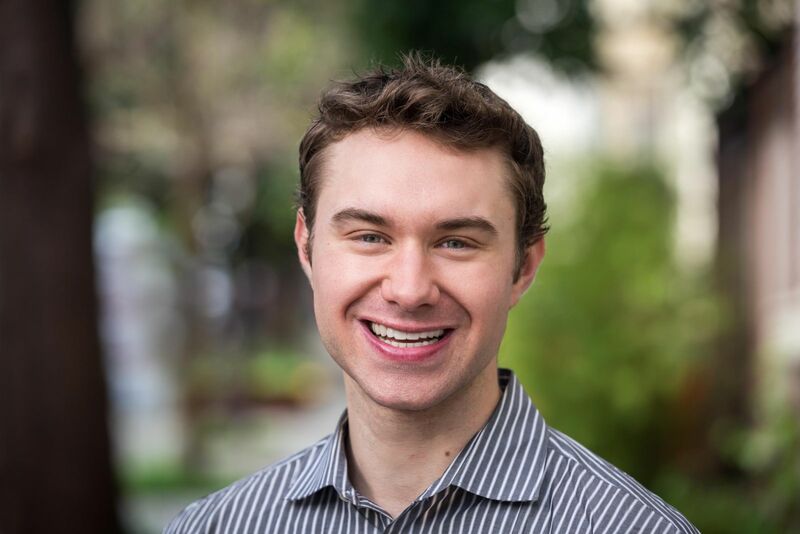 Consistency: What can I put on auto-pilot to drive more predictability? 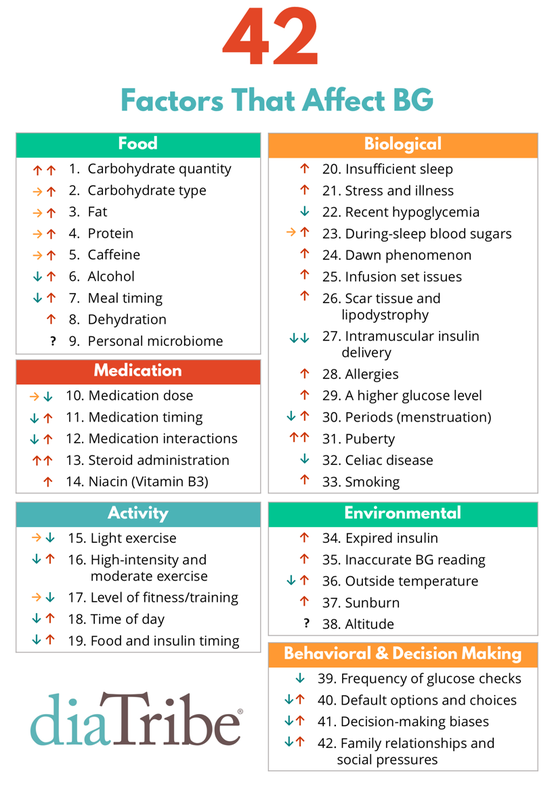 The full list of 42 factors illustrates how complex diabetes is, but it also reveals an opportunity: if I can add more predictability to my diabetes routine, I can reduce the number of variables in play, and therefore, sources of error and frustration. For example, pretty much every day now, I eat chia pudding for breakfast. I’ve had it over 300 times now, and it’s an extremely predictable meal that I can make at home and while traveling. I know I need only one-unit of insulin to cover the tiny blood glucose rise, and if I forgot to bolus, I’ll rarely go up more than 20-40 mg/dl. 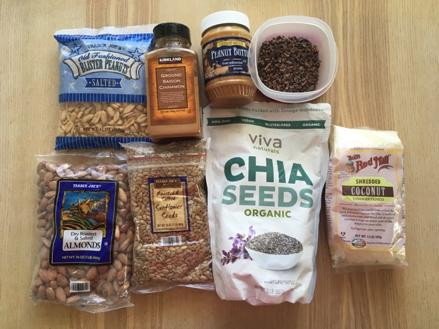 Even within this predictability, I can still have variety – there are many ways to tinker with chia pudding, like using almond or coconut milk instead of water, adding cacao nibs or no-sugar dark chocolate chips, using unsweetened shredded coconut flakes instead of coconut oil, adding more or less liquid to change the consistency, letting the seeds soak overnight, etc. If you have chia pudding tricks, please let me know! This strategy of IF ___, THEN ____ also helps in diabetes. I’ve written before about the surprising blood sugar benefits of walking, which I often initiate via an IFTTT approach: IF my blood sugar is high after a meal, THEN I go for a 20-minute walk. IF my blood sugar is high (over 180 mg/dl) when I wake up, THEN I do not eat until it comes down. IF a restaurant order comes with fries/rice/pasta/potatoes/bread, THEN I ask for vegetables to be substituted. This is automatic now because I don’t even want to see these foods and be tempted to eat them – it’s easier to have willpower when ordering vs. when the food is in front of me. IF my blood sugar is low, THEN I correct it with an exact number of glucose tabs (each tab raises me by about 20 mg/dl). What I like about IFTTT is the clear, black-and-white behavioral algorithm to follow – IF this situation comes up, THEN I know exactly what to do. 5. Remember that diabetes perfection is impossible, but learning and improvement are never-ending. These productive, uplifting questions motivate learning and action, instead of the deflating variants: Why is diabetes so unfair? How is this blood sugar possible? I’ve done everything right today! Why can’t I do anything right? Diabetes tools aren’t yet good enough to be “perfect,” but I can always strive to learn something new, run different experiments, and improve – and that mindset helps a lot when trying to conquer the 42 Factors. Visit diaTribe.org/42factors to read last month’s updated article, which added 20 additional blood sugar factors and a whole new category on behavior to the original 2014 piece. 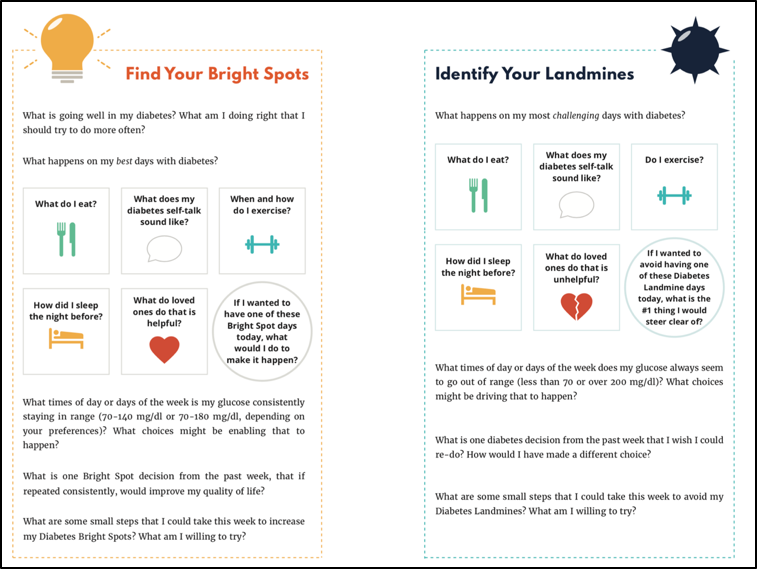 “A must-read for anyone living with diabetes and those who care for them…No matter where you are in your diabetes journey, life will be easier after this read.” Review of Adam Brown’s Bright Spots & Landmines from Phil Southerland, Co-founder of Team Novo Nordisk and author of Not Dead Yet (36 years living with diabetes). If you don’t have your copy of Bright Spots and Landmines yet, get it here for free or name-your-own-donation! You can also purchase it in paperback ($6) or on Kindle ($1.99). All proceeds benefit The diaTribe Foundation, our 501(c)(3) non-profit.